I've donned on the Canadian tuxedo. You know, just trying to channel my inner Britney/Justin circa 2001 in this outfit. If you are not familiar with the Canadian tuxedo, it's simply a denim on denim outfit. Denim on top. Denim on the bottom. The key to making this outfit work is having two different washes to help break up the look, and not to be too matchy-matchy. I opted a lighter wash of the chambray shirt to contrast my dark boyfriend jeans. I also added some a bold pattern and metallic accents to dress up this look a little bit. 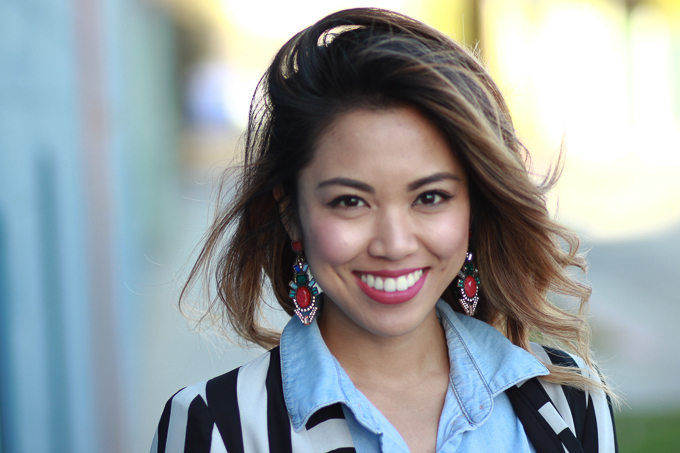 The striped blazer gave it a bit of that nautical feel to the look. 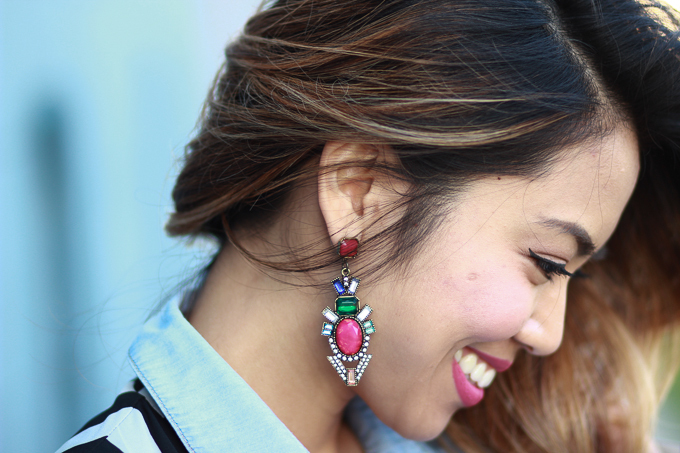 And since I chose a baggier or looser fit jeans, I thought the earrings added a touch of femininity and pop of color which made it spring appropriate. This pair would also make for a cute spring accessory (and it's available in two different spring-ready colors!). 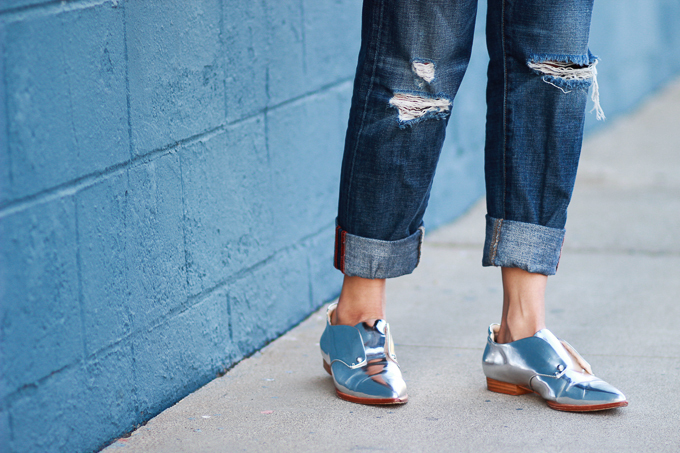 I've been loving these metallic oxfords lately as it instantly added a bit of an edge to my outfit. I'm definitely going to be wearing these more often for spring. What it claims: "Has 100’s of thousands of fibres in an oval shape to provide applications to a large area of the face. 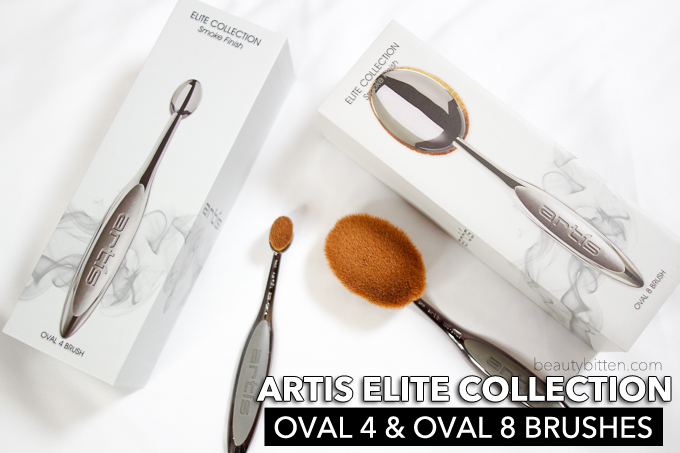 Artis brushes are made exclusively with CosmeFibre, a revolutionary engineered fibre made for applying cosmetic and makeup products" (from the Artis website). Coachella weekend one was this past weekend, and I definitely felt the FOMO feels as I watched my friends's Snapchat story. However, that didn't stop me into dressing as if I'm going to the event myself. In my efforts to utilize more of what I have in my closet, I found this denim skirt folded in my closet. I decided to pull it out and get some leggy visuals since the sun's out. One thing I learned at Coachella last year about dressing up was layering is key. Yes, I know it can get scorching hot in the day time. This lace top is perfect since it doesn't block out the air that'll help you stay cool. And if you'll be spending the whole day at the festival ground, you would definitely need at least a light jacket come nighttime time. It gets very cold once the sun sets. I made this mistake the first night, and I almost froze to death (ok, maybe almost gotten sick). 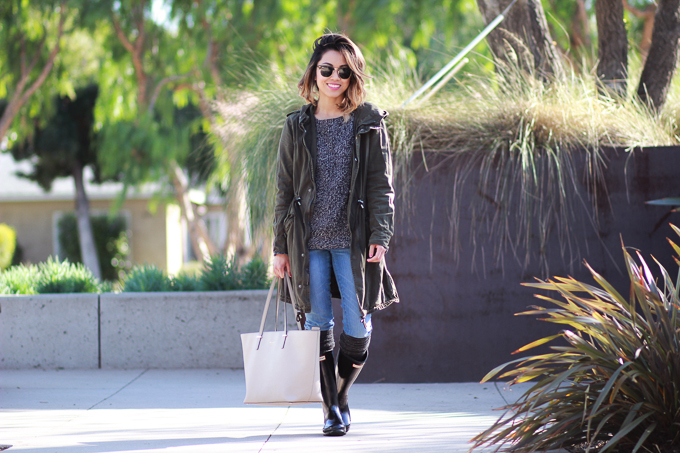 So a light jacket, like this military jacket, is perfect since it goes with pretty much any outfit. 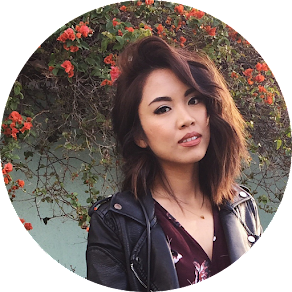 For more Coachella outfit inspiration, check out my previous Coachella outfits here. Did you attend or planning to attend weekend 2 of Coachella this year? What is your favorite Coachella trend this year? And, if you attended who was your favorite performer? A new month means a brand new bullet journal spread. 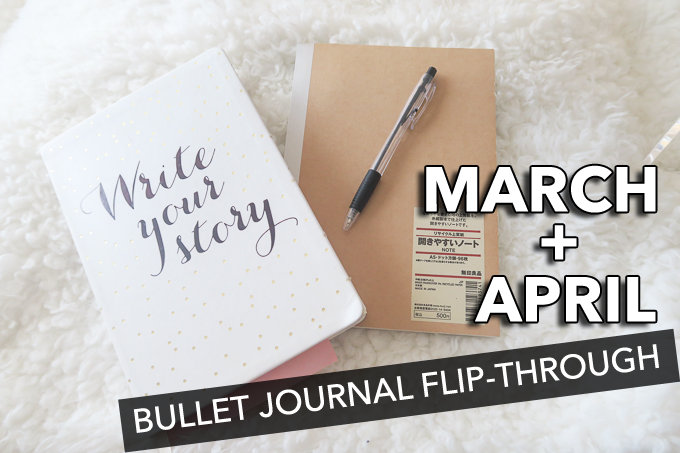 See what's currently in my bullet journal for March and April. I hope this will give you some ideas on how you can set your bullet journal up. 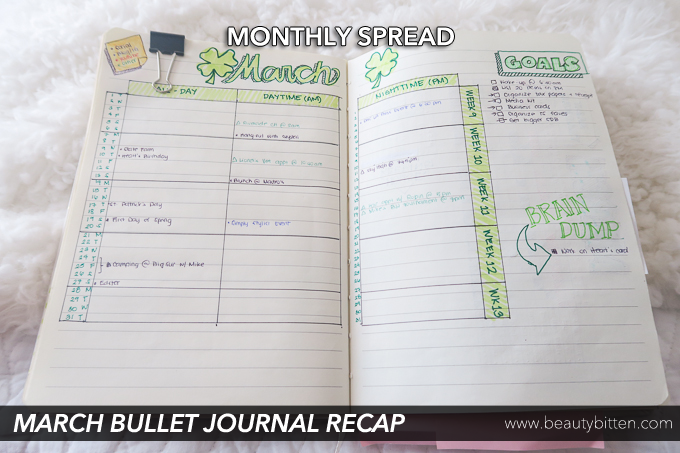 In my first bullet journal post, I shared how I've setup my bullet journal for the month of March (view post here). Here's a quick recap of March with my doodles and writings in it. I'll also share which ones I've decided to keep and change with a brief review of what I thought of the pages in my bullet journal. After realizing that I rarely check or referred to this page, I decided that I will no longer be using this layout for the new month. I found it very hard to read at times and can be a bit crowded for my needs. I also found it very limiting for when I have multiple appointments or events in the day or night. I changed my monthly spread layout for April as seen below. Not gonna lie, but I've been loving how it's been raining lately here in LA. As much as I appreciate LA's sunny weather, it's a nice change when it's gloomy and raining outside. 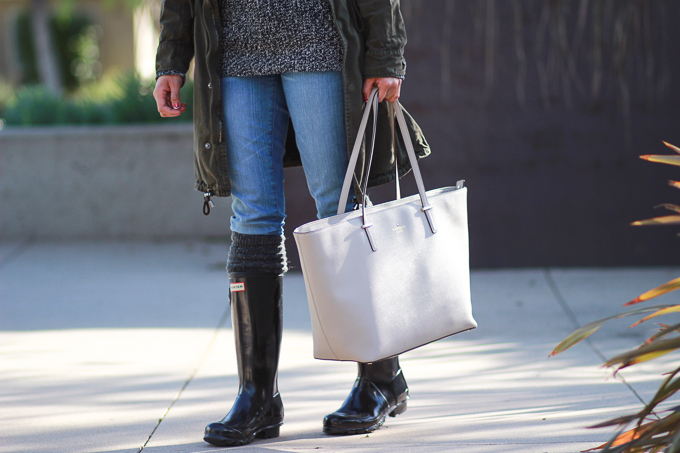 It also gives me a reason to take out my Hunter rain boots that rarely see the light of day... or should I say the rain? I frequently get questions about my Hunter boots on how I really feel about them. As much as it doesn't rain here in LA, I love wearing them when it does. In fact, sometimes it rains a little bit more often here just so I can take them out of the box. This is the style of boots that I have. Since I'm a little bit shorter and have a smaller feet (I'm a size 6 for reference), I decided to get the big kids version of these boots. I'm wearing size 4 (boys)/5 (girls). If you're a true size 6 (women), you'll still have some wiggle room inside. These would easily fit if you're a size 6.5. I've worn them in the snow and layered two socks (or boot warmers) for additional warmth. They're a little loose if you wear them with thin crew socks if you have a size six feet. Not sure if it was just me, but it took me awhile to get used to these boots since they are made of rubber. You might want to bring extra shoes if you're going to drive with them. The shaft of the boots are fits just right for me even if I layer thick socks over my pants. I also much prefer the big kids version for my height (I'm 5'1) since they don't hit my knees like the adult versions which makes them more comfortable for walking. I hope you guys had a great weekend! I'm still trying to get my place in order and on top of that finish get started on filing my taxes. The agony go getting them done. But it's one of those adult things that just really has to get done. It'll be my fun before-going-to-bed activity. With all the spring cleaning that I've been doing, I've also been updating my Poshmark closet with some new items. Please check it out and give my pre-loved/barely used items a new home <3.